The age of the portable tape recorder is long gone. Today, it is all about mobile devices such as your mobile phone, digital camera, GPS, MP3, laptop, and tablet. In almost every case, these devices have a built-in rechargeable battery that needs to be charged on a regular basis. So, how do we do that conveniently? Until recently, each device came with a charger. The connection to the unit was almost guaranteed to be device-specific. For instance, the charger for your mobile phone did not fit your daughter’s, because it was another model or brand. And forget about using one kind of charger to top off some other type of device, such as an MP3 player. In other words, no more phone calls or listening to music when we leave the house without the proper charger. The European Community now obliges manufacturers of mobile devices to provide their products with a universal connection for chargers. Manufacturers opted for the USB Type A connection. A new mobile device probably still comes with a charger, but the box will definitely also include a cable with a universal USB plug at one end. This enables you to charge your mobile devices using a USB connection without having to use various different chargers. As a result, the user’s convenience and comfort increases. That is unless you have to start up your computer first. However, there is a solution. Most manufacturers of switches now have a USB wall plug in their portfolio. The device is built-in into the wall just like a normal socket. It only needs a 230V connection. Most USB modules have two USB exits at the front, each supplying a 5 V DC voltage for charging mobile devices. It is possible to charge two devices at the same time. Normally this would require two separate sockets. To be perfectly clear, such USB wall plugs only provide power; they cannot be used for transferring data. Certain manufacturers also offer the combination of a traditional 230V wall plug and a USB charging point, which fits nicely into a standard built-in box. Imagine the convenience of multiple USB wall plugs anywhere you might need them. For instance, in the living room, study, kitchen, or bedroom to name just a few locations. It is simple to replace an existing traditional socket with a USB wall plug or a combined USB 230V socket. In other words, separate chargers are history. Put your charger in the wall. The Peerless-AV 47" Consumer Outdoor TV is an all-season solution for outdoor entertainment and living. Featuring an IP65 rating, the TV is water and dust resistant. It can also operate in severe temperatures ranging from -24 degrees Fahrenheit to 124 degrees Fahrenheit. The Peerless-AV 47" Consumer Outdoor TV is maintenance-free with no filters needing to be cleaned and/or replaced. The TV is constructed of aluminum and features safety glass, a bright picture, and 1080p. Vent-less design prevents water, dust or insects from entering the display and provides the highest environmental protection in the harshest environments. Anti-reflective, impact-resistant safety glass protects the screen against damage. 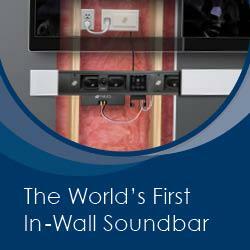 The Cynema Soundfield is the first in-wall soundbar that installs below any flat panel TV without the need to cut studs. Its three self-contained loudspeakers can be adjusted along rails allowing for ideal placement, regardless of stud location. 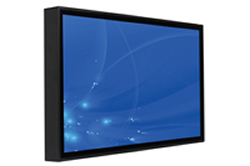 Available in lengths of 48, 55 and 65 inches to match today's most popular display sizes. It's a seamless and simple solution delivering both superior sound and ultimate ease of installation. DC Power Supply Mounted Separately Sends Low Voltage DC Power Through Wall To Amplifier Module Allowing For Installation Without The Need For An Electrician. Mounting System Allows For Ideal Placement Of LCR Speakers In Any Existing Stud Configuration. Easily Connect Wireless Subwoofer Utilizing Nile SW-T Transmitter And SW-R Wireless Receiver. Simply Connect A Distributed Audio System And It Is Automatically Selected When The TV Is Powered OFF. TV Sound Always Takes Priority When The TV Is Turned ON, Even When The Whole House Audio Is ON, Greatly Simplifying User Operation. The PeerSound Wireless Audio System is the industry’s first and only rack mountable wireless audio transmission system with a remote antenna that allows professional installers and integrators to send up to eight channels of audio wirelessly to receivers/speakers up to 140+ feet away. Designed for AV dealers, integrators and installation professionals, the PeerSound System provides a reliable wireless solution for zoned audio systems or can be used to support surround sound applications. The PeerSound Wireless Audio System offers professional installers and integrators with a useful set of features not available in any traditional distributed audio system. Plus, it can meet many needs at once, such as reaching additional zones that are costly and/or difficult to run wires to and providing added surround sound. Self-contained 120/240V power supply and UL 2043 plenum rated amplifier: Featuring a built in 120/240 volt power supply, PeerSound’s amplifier gives installers the freedom to forgo high voltage to low voltage converters, offering more install flexibility and ease.